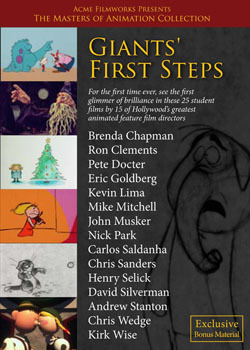 Acme Filmworks has just released a DVD collection, Giants’ First Steps, which is of particular interest if you are intrigued by some of the biggest names in current Hollywood feature and television animation – and have wondered how they got there. This is a collection of 25 student films by 15 well known Disney-Pixar-Blue Sky-Dreamworks directors – an entertaining account of their earliest efforts which pretty much reveal how much talent these filmmakers had right from the start. Curated by producer Ron Diamond in collaboration with The Academy of Motion Picture Arts and Sciences, this is a vital compilation for students of animation. What’s particularly fascinating is that you can see the seeds of the filmmakers future work in many of their student films. 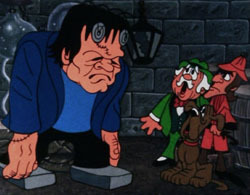 For example, Ron Clement’s Shades Of Sherlock Holmes foreshadows Disney’s The Great Mouse Detective, Pete Docter’s Next Door has themes later explored in Pixar’s Up, Eric Goldberg’s Good Old Fashioned Cartoon Violence presages his future roles on Looney Tunes: Back In Action and Aladdin. In addition to curating the set, Diamond supervised a superb 4K restoration of these films, originally made in Super-8, 16mm and 35mm film formats. Included is a wonderfully produced 20-page booklet with photos of each filmmaker (then and now), quotes about each film and other background data. Not all of these are Cal Arts films (though many are), other schools represented here include The School of Visual Arts, UCLA, Ohio State University, Pratt Institute and the AFI. They may be student films, but every one is worthy of study and discussion – especially in light of where each filmmaker went later in life. Among the many highlights: Nick Park’s chalkboard animated version of Jack and The Beanstalk; Carlos Saldana’s computer animated “Puppetoon” Time For Love (similar, but different, to George Pal’s Together In The Weather); Chris Sander’s exquitely pencil-drawn Fun With Father; three surreal mini-masterpieces of experimental filmmaking by Henry Selick; David Silverman’s two witty UCLA student films (his Mariner Man features a vocal by Bill Scott! ); and Andrew Stanton’s hilarious Somewhere In The Arctic and A Story. Brenda Chapman, Kevin Lima, Mike Mitchell, John Musker and Kirk Wise also contribute their earliest works. None of these animators have anything to be ashamed of – most of these films hold up quite well regardless of their age and techniques. Bonus features contain an informative three-part breakfast summit with John Musker, Ron Clements, Mike Mitchell and David Silverman discussing their careers, the days at school and the films themselves with producer Diamond. Almost none of these films are online – but I found this one example (below), Chris Wedge’s 1985 Tuber’s Two Step. Not really a student film, but its Wedge’s first foray into CG. Wedge’s earlier, stop-mo clay animated The Daymaker (created at Purchase College, SUNY), is also included in this DVD set. 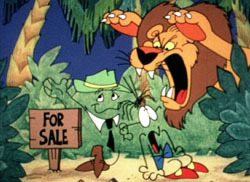 Needless to say, I highly recommend Giants’ First Steps – its an important piece of contemporary cartoon research. Both A Story and Somewhere in the Arctic are on the second volume of the Pixar Short Films DVD series. 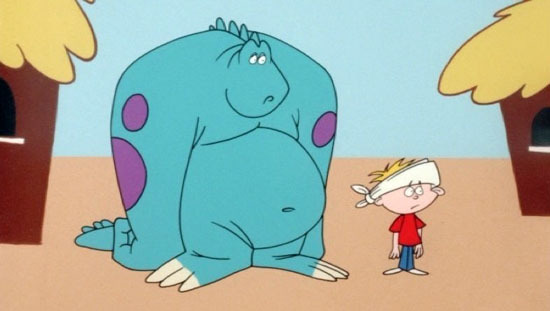 I recall “A Story” and Doctor’s “Next Door” showing up on several Spike and Mike Festival of Animation videos back in the VHS days. Really loved the message of Next Door’s bridging the generational gap in such a concise yet powerful story (not to mention the approach to design which I’m sure most of us who saw this before “Up” could tell). fun with father is a must have.